Contains 5% ultra-pure glycolic acid in combination 2% salicylic (an acne medication). This cleanser contains Green Tea Extract and Zinc. Wet affected area, apply, and rinse well. Because Drying of the skin can occur, it is recommended to start with one application per day, then increase to two or three times per day if needed or as directed by a physician. If extreme dryness occurs reduce application to once a day or every other day. Inactive ingredients Camellia sinensis (Green Tea) Polyphenols,Cocamidopropyl Betaine, Disodium EDTA, Fragrance, Glycolic Acid,Linoleamidopropyl PG-Dimonium Chloride Phosphate, Polysorbate-20,Purified Water, Red #40 [CI-16035], Sodium C12-15 Pareth-15Sulfonate, Sodium C14-16 Olefin Sulfonate, Triethanolamine, Yellow#5 [CI-19140], Zinc PCA. I love this cleanser. My dermatologist recommended this product to me. Has a light scent. Clears my skin and makes it soft and glowing. I really like this 5-2 Gyl-Sal cleanser for many reasons. First of all it is very affordable compared to all the other brands Ive tried over the years. I love how it does what it says. It cleanses and gently exfoliates keeping my oily skin with persistent whiteheads, blackheads, clogged pores and cystic acne in check. FINALLY- it helped clear my skin and I now see a clear face looking back at me in the mirror for the first time in way too many years. What is not to like about that? As long as this cleanser is sold-it will be part of my clear-skin-regime.The regimen that worked for me:Hands off face. Wash my face religiously twice daily with this 5-2 Gyl-Sal cleanser alternating every 2 days with a antibacterial face wash w/ 5% Benzol Peroxide (Elite MD). 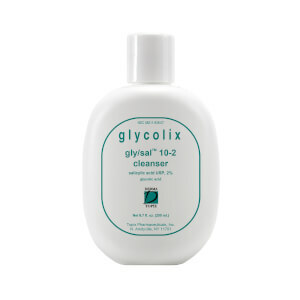 On cleansed dry face I use the accompanied 2% Salicylic Acid w/Gly presoaked pads (Glycolix or Elite MD). I use the Clariasonic at least once everyday, sometimes twice daily. Every 2-3 days I use a retinol cream overnight. The combination of the above worked a miracle for my stubborn acne & scarring. When I get an occasional pimple the crud comes to the surface and is gone in 1-2 days. Ill most likely be adjusting this regimen during the summer months to the 10-2 Gly-Sal cleanser, using the 2% BP/Gly soaked pads twice a day. My face does get a little dry with this extreme regime-because of the exfoliation plus winter- so I HAVE to religiously wear sun screen and moisturize, moisturize moisturize. My combo skin- zit prone face responds great to "Bee Yummy skin food which not only moisturizes but also feeds skin all kinds of beneficial natural nutrients plus keeps my acne in check with its natural antimicrobial properties. My skin has never looked better and now I do not spend a fortune on makeup to cover up acne and scarring.Please keep this product and the soaked pads--they really work together in my skin regime!! I purchased this cleanser on a recommendation as I have open pores and occasionally get spots at 37.I immediately noticed a difference in my skin while using this product. My skin has become clearer and the pimples I had have cleared up.I was initially worried that this cleanser would dry my skin or cause my skin to flake around my mouth (as other cleansers have done), so I have only been using it every night but this has not been the case.You only need to use a small amount so the bottle last for ages and it is also a reasonable price.I know that by using this product I am taking the right steps to keep my open pores clean and to prevent blackheads. I have combo/oily skin, and this cleanser works great for me. I used RX Systems 15% glycolic cleanser for a long time, but decided to try this because the price is great, and I'm very happy so far. I use this cleanser twice a day - first thing in morning and once at night. I then follow with the 5-2 pad only at night and I have not broken out since. This stuff is awesome! I just started using this a couple weeks ago and it is wonderful. It's very concentrated so a little goes a long way. I have oil/acne prone skin and this works great with my acne med's. Worth every penny!